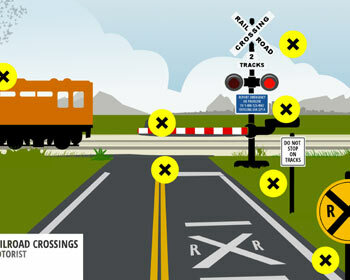 Image credit: Federal Railroad AdministrationThe highway-rail crossing accident has been long recognized as a priority safety concern for worldwide rail industries and researchers because traffic crashes at highway-rail crossings are often catastrophic with serious consequences, which include fatalities, injuries, extensive property damage, and delays in both railway and highway traffic. Relatively few studies have focused on investigating accidents at highway-rail crossings. Salmon et al. (2013) indicated that because of limited research efforts, various aspects of highway-rail crossing safety performance remain poorly understood. Therefore, a safety evaluation (i.e., accident frequency prediction) of highway-rail crossings is needed to re-examine both prediction methods and contribution factors (Austin & Carson, 2002). Generalized linear models (GLMs) have been frequently used in highway safety studies to explore the relationship between crash likelihood and contributors and to forecast future highway rail grade crossing accident likelihood because they are believed to be better suited for discrete and non-negative crash frequency data. However, GLMs have several limitations, such as a pre-defined underlying relationship between target variable and predictors and their limitations to fit dynamic non-linear relationships. Non-parametric data mining methods are gaining popularity because they are not required to pre-define the underlying relationship between dependent and independent variables. They also model non-linear relationships among variables with missing data and between contributor variables and predictors. This research seeks to investigate highway rail grade crossing (HRGC) crash predicting models and contributing factors by exploring the application of GLM and data mining models. In summary, data mining models can serve as great alternative modeling tools to perform crash forecasting with relatively accurate forecasting power and strong ability to model non-linear relationships between contributors and crash likelihood. All the models will provide different sets of contributors. However, decision tree models may be hard to apply due to their large tree structure. Since GLM models are parametric, they tend to pick a limited number of explanatory variables; data mining algorithms, also considered as non-parametric algorithms, tend to select more contributor variables. However, the top contributors identified by all the methods agree with each other on traffic exposure variables, such as highway traffic volume, rail traffic volumes, and their travel speed, and also on some crossing characteristics such as warning devices. Lu, Pan, Denver Tolliver, and Zijian Zheng. Highway-Rail Grade Crossing Traffic Hazard Forecasting Model , MPC-18-354. North Dakota State University - Upper Great Plains Transportation Institute, Fargo: Mountain-Plains Consortium, 2018.